i’ve been playing the original NES version of the 80’s arcade classic galaga for a while now. there doesn’t seem to be much info specifically on the NES port, but there are some interesting differences. one trivial difference is that the game was subtitled “demons of death” on the cartridge for no apparent reason other than to titillate would-be purchasers i suppose. aficionados will also notice that the graphics take a minor hit compared to the arcade version, and there’s also a notable difference in gameplay in that your ship is only allowed two bullets onscreen at any one time. this change, no doubt due to limitations of the hardware, makes the game a bit harder and will cause those used to the arcade version to have to adjust their strategy, but to compensate there’s an additional feature where if you press the A button you’ll automatically fire two bullets in quick succession. this really saves your thumb, and i found myself switching back and forth between the two-bullet fire and the regular one-bullet fire, depending on the situation. one other minor change is that the stage and # of ships remaining info has been moved from the bottom of the screen to the right side. this also takes a bit of adjusting since it’s harder to see exactly where the right edge of the playing field is, but i found i got used to it after a while. all in all even for die-hard fans of the original version this is still a very good port of the classic game we all know and love. 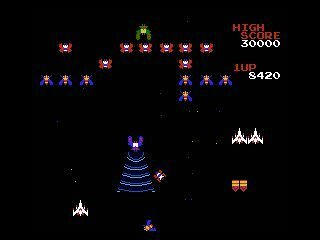 as for galaga in general, call me a retro gamer but to me this game truly stands as a monument to practically perfect classic gaming. the controls, graphics, and music/sound are all great; the pacing at which the difficulty increases is spot on; and the gameplay is simple but beautifully clean and elegant. there’s also a constant variety within these parameters that keeps you coming back for more. the most obvious are the challenge stages interspersed throughout, of which there are eight total, and most of which take some mastering to achieve perfect scores (i.e. 40 out of 40 enemies defeated). but there are also other variations as well. there are several different enemy entrance patterns, and if you do well (i.e. defeat a lot of the enemies as they enter) the main part of the stage in which you face off against the enemies you didn’t defeat is significantly easier. then there’s the main part of the stage in which you dodge the swooping enemies and their bullets, with the added event where one enemy morphs into three special enemies that give a sizable bonus if you defeat all three. the most eye-catching feature is the ability to win back a captured ship to double your firepower, although i ended up not using it that often and i doubt most hard-core galaga players do. galaga links attacking from outer space!